Forums - Good "3D" recordings? After my visit to the "Raven's Haven" I decided it was time to enter the world of tuning my room and thus far built six absorber panels. I am now testing them out and playing with the position/orientation and having pretty good luck getting a better 3D sound stage. Any recordings that emphasize the 3D effect/placement of musicians you'd suggest listening to? I have some of the usual suspects like Pink Floyd and a smattering of live Jazz and well recorded studio jazz (Kind of Blue, etc.). Funny you posted this, I was thinking about posting almost the same thing the other night. I was popping in some albums and getting mixed feelings about what I was hearing. It seemed to me the instruments with treble (flute, cymbals, shakers, piano) where simply floating in the air. But then guitars and sax were glued to the speaker. I'm not sure what's up with my Zen amp, but it's blossomed lately. I'm getting some really great sound out of it, and it just makes me crave that 3d holographic rendering even more! So I wanted to ping the group here, and see what others though of as their most favorite 3D recordings that I could track down and compare notes! "Earl Hines Plays Duke Ellington" is a recording of fantastic solo piano by one master playing the music of another master and the quality of the recording can make this sound like a real piano in a room on a great system, worth checking out. There are different releases of this on vinyl and cd, there were three volumes altogether but they all share the same excellence so any and all will serve. Thanks Lon, I'll check it out. I appreciate your contributions to the "what's spinning" thread as well. Whenever my music gets a bit tired, I get lots of ideas for new music there. and its always a pleasure to get drawn in. Decware: Rachaels x 2 bridged, C. SP2+, ZP3, ZMC1, DHC-1 pw/cbl`s Michell Orbe + SME V + M.Benz LP s , Nakamichi LX5, Lowther acoustas DX2`s, WE 16g sp/cbl`s, Isotek mains substation, M & K subwoofer, Belden 8402 interconnects. You could try these...mine are error corrected redbook Cd files. If you like Bosa Nova in a newish, but more or less old style..."bluebossa" by Ana Caram. Great sound stage width and depth. Archie Schepp and Niels-Henning Orsted Pederson, "Looking at Bird"...pretty mellow Schepp...just sax and stand up bass. Not a huge stage, but just right and a nice recording...holographic. funny, i have the torii 3 and err speakers and they all sound like that to me. i do have a little bit of a cheater and those are Argent Room Lenses. No longer made and hard to find used, but if you ever see a pair, grab them. With every speaker I have used, they have increased the soundstage width and depth as well as specificity of instrument placement. They are basically Helmholz resonators that sit next to each speaker. That aside, any of the Riverside Bill Evans recordings are generally first rate in quality of recording and holographic image. Waltz for Debby; Sunday at the Village Vanguard; Everybody digs Bill Evans, etc. I might make a set and see what happens. It's a neat concept, but hard to swallow at $1200 for a set of three...especially when they offered no way for tuning them for your rooms particular nodes. I've always found Madonna's redbook CDs to contain tracks with 3D effects. One of my favs is "lucky star". On a good audio system, one can hear the "star" rotate in 3D space around in an imaginary circle. Thanks everyone for your responses. I think there may be some good examples there of what I am after. Maybe a more specific description of what I hear could help one of you steer me in the right direction - via other recordings to test and/or room treatments to explore. I have now achieved a virtual soundstage that eclipses the entire area in front of my listening chair. Speakers disappear. Height and width is only limited by the recording. Overall depth of the complete stage is good. Within that soundstage, on good recordings, the individual instruments and/or vocals have their own 3D "orb." They seem to float within that soundstage having their own height, width, depth and radiating decay. What I feel is still compressed is where those orbs of sound appear in that soundstage from front to back. So I can't tell for example, where the bass player is positioned relative to the vocalist, etc. in terms of depth. I know they are on the left side, but front to back on the stage, everything seems somewhat bunched up in the rear of the soundstage. So I was looking for good recordings that others can definitely differentiate the front to back location of the "orbs" within the soundstage so I could see if I indeed do have a issue to work out. 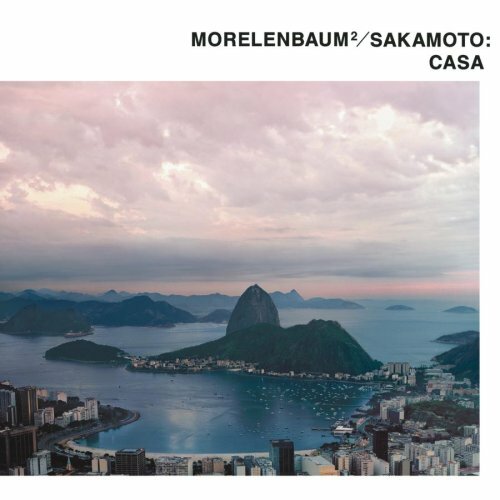 Try this trio and occasionally quartet recording of Jobim tunes recorded by alumni of his bands in his own private home studio. Should give you that pinpoint imaging and spatial location. And is stunningly beautiful music: piano, cello, voice (and a bit of percussion here and there). Paula sings, Jacques plays cello and arranges, Ryko plays piano and arranges. That sounds right up my alley, Lon! Thanks Lon. Also thanks for turning me on to Jobim via the what's spinning thread. You know what I have done with absorbers. If I still get the "orb bunching" with this fine recording, to your knowledge, would diffusers help the situation? ....large thread here to check out! You might not have SDA like I have... . However, with a Decware Amp it is there with these too! It's all about time smearing of the original recording. The more you can reduce that smearing, the sharper your imaging will become. Steve's amps already put you a huge leap ahead of the crowd when it comes to reducing that smearing. Then you have your crossoverless speakers, huge plus. With the absorbers you've added, your already hearing a big improvement due to further reduction of that time smearing. Diffusers (and absorbers) aren't a silver bullet. It really takes a combination of things (your gear is one of them, and I think you're fine hardware wise) to get the room dialed in so your 3D imaging can happen. I've already mentioned getting your room balanced left to right, and you've already seen what absorbers can do. The next step is to get a program like REW, and a good Omnidirectional Microphone, and start taking measurements! Balance the frequencies, tame and dial in your reflections, and your imaging will come into sharper focus. My room/system does really well width, height, and depth, with great spacial accuracy and individual player saturation. Though I prefer the sound with HR-1s, soundstage did not change notably going from MG944s to HR-1s in this room. I don't have any official diffusers, but do have round log beams with angled rough wood boards for a ceiling, irregular adobe walls, and open segues to other spaces. I also use Synergistic Research Art Basik bowls (they are placed at first reflection points on the sides, and front and back) and a Kemp Schumann resonator. Both contribute to a more defined sound and soundstage in this room. I have used these for years, so thought I should test them. The difference is subtle in ways, but each is quite clear in contributing its own part. The combination is a very real aspect of a great soundstage. As LR said, the Decware is a big first step, but in this room, these tools really help. I can't say how much they do compared with official diffusers since I have none. I also built a small low bass, and a small mid bass trap, and more absorbers strategically placed in areas where sound got bunched up. One thing I have really noticed in this difficult room is that when my bass/mid-bass is too dominant in the frequency balance, masking the upper mids and highs, at some point it weakens the sound stage. Right now I have a nice warm tube set that is really good at sound stage though, so it depends on tubes here. I do generally use less pushy, less dense OB3s in my Torii rather than OA3s giving a sound that is still warm, but more articulate. Also, this is where the Schumann resonator contributes in this room...it articulates without messing with the frequency balance in any negative way (positive actually, better micro detail rounding out the timbre).... I think anything that contributes to good power treatment and vibration control really helps by cleaning up/articulating what is there. My other room also has a great sound stage with a similar ceiling to this, and with segues to other spaces, but with flat sheetrock and masonry walls. It does have a lot more speaker placement flexibility though and it has a great soundstage with no treatment at all, not much of a power filter, and no vibration control. I have not put much energy into that system yet, but the room is so easy, and I don't use it as much, so it is not pressing. I also find the recording effects the quality of soundstage location and saturation, or, likewise, with well saturated spacial information, the plausibility of the player placement is not always great based on engineer choices. The recordings I mentioned above do width and depth well in my rooms. Don't know if you can play digital files, but if you can get individual songs without compression, "Inutil Paisagem" is the test tune I use on Ana Caram "bluebossa." Not being as saturated and simple a recording as the Schepp one, it is a good test for bass and drum differentiation in width and depth. They are well back through the wall in this room and spatially well placed, the drums further back and right, the bass forward of them and left. One with big, complex, and layered music is Vision: The Music of Hildegard von Bingen. This is a new style Hildigard thing with additions of bass, big drums, bells, and with the occasional obvious electronic hyped instruments I uncheck in my play lists, but that is me. There is clear attention to sound stage in this production. I use the tune "Praise of the Virgin" as a test tune. Great for analyzing width and depth, bass, soft or hard mids, highs...the lot. Also Ayub Ogata the tune "Kothbiro." Nice saturation width and depth, and a good test for depth. With subtler depth differentiation on some of the up front voices and instruments (several feet here), it is quite deep on others. For me the piano is about 15 feet behind the speakers and the bass a bit forward of the piano and not far left of it, so a good test for depth and right/left location and saturation. Good luck pulling in the front to back part! Palomino #10 Description of soundstage is much the same as mine. I use diffusers, 7 1/2 x 4 1/2ft rear, 4 off 4 1/2 x 1 1/2ft side walls, bass traps in corner behind speakers. Depth is more noticable on the sides because, I think, you have the `back soundstage` and the speaker plane themselves....it`s more apparent. Moving center stage is where you have to take the, how shall I say, `clarity` or `up in the mix more` of the singer as the hint he is in front of the drummer. That you can hear all the drummers work also clearly is 3D ish. My bass player is usually to the right for me (does anyone swap l/r over at times). His notes are thicker bandwidth and intended to radiate so pinpointing is not always possible. You know he`s standing over there and seperate from the drums. If he `intentionally` plays down in the mix then you have to listen more when he goes into the drummers terratory. Again, hear all the notes ( thankyou Decware) Guitars can be anywhere. The engineer may want to present the band as they appear live even though the recoding is made up gradually. Some bands will record live, all in the same room, mikes picking up more info which all equates to spatial placing in the recording and playback. a good example have that atmosphere..and I dont like to say 3D these recordings bring the soundstage around from the backcorners and further along the walls in 3D body. Front ends lol If I had a koestsu the singer might be treading on my toes. Will, I'm so intrigued by those little bell like cups and stuff you have. I'm very, very skeptical, but very curious. Marky, you have photos of your setup!? I love seeing rooms with sound treatment! Yes, I get that.....very, very skeptical is a clearly a school of thought in audio land for things that we don't clearly get.... I mean, how can a little box broadcasting 7.83 Hertz (Schumann Resonance) help articulate the sound and therefore the soundstage? You have got me. Since my system/room has gotten so revealing though, there is little that surprises me any more. I mean there are still a bunch of folks who don't believe different wires, wire configurations, cable ends and so on make a difference, and I hear differences in every cable I have. Perhaps not profound in some ways and some times, but in serious listening, and for the last few percent, meaningful...and in my travels the last few percent are really important. But if one can't hear it, for whatever reasons, be it system or room issues, attitude, or physical issues......that is as it is. My system lets me hear a lot though....so I tend to check stuff out if there is a compelling reason (like trying to avoid lots of obvious room treatments in the living room), and when I have had enough plausible explanations to believe the possibilities, AND as long as it can be returned! It is all a lot of interesting exploration to me...this quest for the sense of players in the room. I have been getting that for a long time, and even so, I am always surprised to have it get better with this or that change. Also interesting to see how different folks get there. Thanks for the treatment pic page by the way. It is nice to see the possibilities of beautifully applied room treatment. I'm getting a great horizontal and vertical soundstage and good holographic voice and instruments. I am just trying to get them more separated front to back (with recordings that are engineered this way). Are your speakers turned in that much? I guess you have tried different to-ins...mine are very slightly toed OUT for the best effect in this room. Even a 1/4 inch has some effect....Bound to be variable depending on room reflections, but I would think worth experimenting in small increments from where they are right through to just a bit out from straight on if you have not tried this. 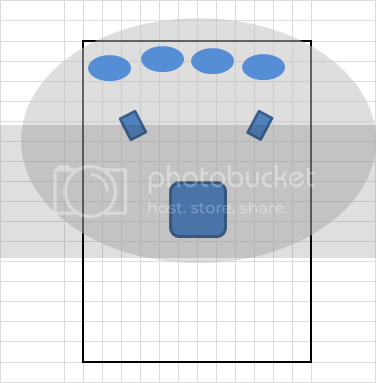 Other than for mid bass, bass, and excess reflections, my "treatments" are 1) the points on the side walls where with a mirror, you can see the tweeter from your seat 2) front wall center and back center. If you don't have bass issues to muddle the mid-high info, might be worth the experiment to hang a thick towel at the first reflection areas, and maybe in front and back of your head position (tending to highish rather than lowish).... see what happens. Perhaps rugs or carpet parts, or a towel sort of rippled/bunched a little like drapes, for more effect in the experiment. 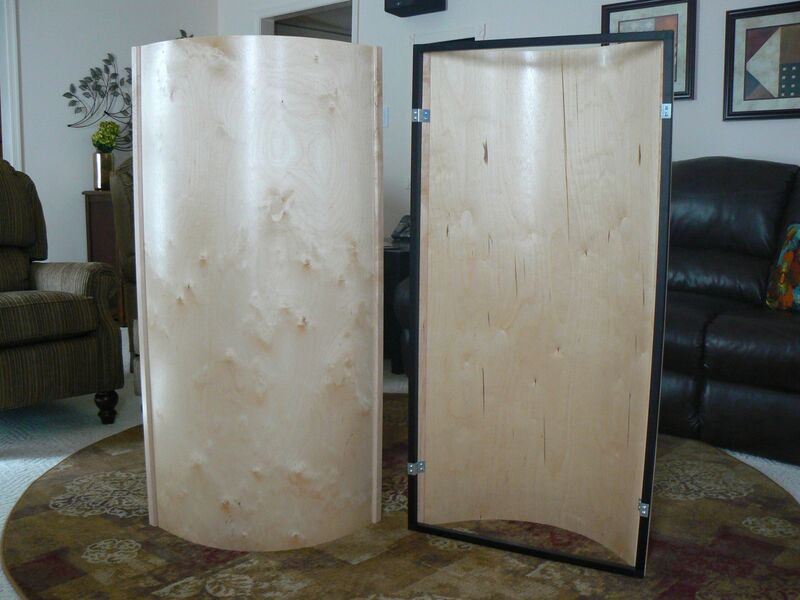 If this seems to help, and you can aesthetically deal with it in your room, 2" dense fiberglass panels with stretched, musically transparent cloth are not too hard to make. If you have all hard walls and glass now, this cutting reflection with absorber angle could be a pretty good one to play with. My speakers are actually toed in about what is showing in the diagram. I experimented to get to that point but I continue to play with it. I'll start pointing them further out and see if it helps. I recently built 7 24X48 2" panels http://acousticsfreq.com/blog/?p=62 and the results were pretty dramatic. That is what got me going on this path. 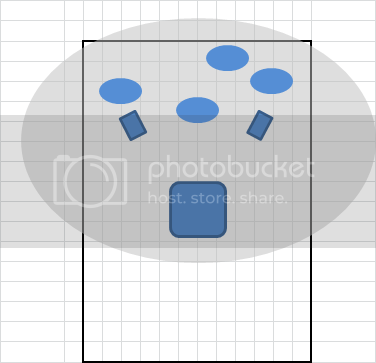 I have one in the middle behind the speakers, two acting as quasi bass traps in the corners, two at the mirror reflection points on the sides, one in the back in the middle and two on the ceiling. Helped the imaging and tamed the bass. Best $120 I have spent on audio. I bet that was a great audio investment! I might be inclined to play around with the seat placement a bit, and/or the absorber placement. There is that Rule of thirds thing some folks use. Whatever though, speaker angle logically effects the trajectory of how the waves bounce around the room and finally to the seat. Also how the absorbers catch, or don't catch waves and reflections. Somewhere in this may be a path for improvement, by changing the toe, or/and the placement of absorbers to catch the waves in a different, but still calculated way. Again, my system is way better at sound stage when the detail is not overwhelmed by the bass and mid bass. And detail does not necessarily mean bright. For some reason 7Dj8's often bring out the right stuff a little more in my Torii. But I wonder, do you feel like your bass is sorted out? Do you need an official bass trap that goes low? Or might more absorbers be better used in corners? Or move the front or back one to become a wall/ceiling angled absorber. Also, offsetting the ceiling ones from the the ceiling a couple inches might allow area for some waves to bounce and die, lowering the frequency that they absorb. I wonder too about the front and back absorbers still mounted flat, but horizontally, but maybe offset them height-wise. I suppose this could give the front to back waves and reflections, whether direct or indirect, a better chance of being caught by one or another absorber. Or...what about putting both vertically on the wall behind the seat (or on the front wall) creating a wider area??? Probably already done this sort of stuff...I am just always inclined to play around to fine tune. I have a lot of reflection here, but my whole ceiling is in effect a simple diffuser and absorber above of the logs and boards. And my walls are pretty organic being adobe, so reflections are less uniform, but also harder to read. I have a bunch of windows too. I put some resonance absorbers on them, and the sound is not appreciably different with the honeycomb shades down. So my room is very live, but the bass is controlled through traps and EQ. It does have good soundstage depth and width though. I just noticed you use a Mini with Audirvana. Audirvana Plus has eq, and may be really interesting to play with. I use AppleAUfliters, which do low shelf, high shelf and three parametric EQs in the middle. With four filters you can do a lot. To find troubled bass zones I set a narrow Q, like .1-.3 octave, jack up the Dbs maybe 10 Db and slowly slide across the frequencies until the nasty resonant ones show up. I write them down as I go. Then it is easy to keep the Q really narrow and adjust down by sound....or to widen the Q's a bit if necessary to cover larger resonant areas and adjust until it sounds right. Also interesting to explore small changes in the mid to upper frequencies, same method as above but less Db...maybe up or down 3-5 Db might tell the tale to find areas you might like more or less of. With the graphic interface in Audirvana, it can be fun to play with it as you listen. Narrow the Q some, widen it, change the cut or hit. I start with recordings that are good, but may be too bassy, or for mids and highs, that may be too intense or hard. It can be tedious, but if you make small adjustments, it is safe enough and can really improve the sound if your treatments are not quite enough, and do it very transparently for your whole collection. You got me thinking on the speaker toe in so I put them flat to a little open and then started toeing them in a bit at a time. I ended up in about them same place. It was worth a shot. I am trying to get the right balance between definition in the middle (vocals, etc), depth and width of soundstage. Not enough toe in yields less definition and a shallower sound stage. I've only just begun to play with the absorbers. I am thinking about some dedicated traps. I also built one diffuser and I'll be working on another today. I set my distances per some equation. I can't remember which one right now. I also have some tubes to roll through. I think I have settled on the best rectifier but will try some different input tubes. I just got audirvana plus so I will be checking out the eq. I am having some problems with it locking up when integrated with iTunes. I think it's locking up when I move from red book rips to high def. I have some time over the break to play around with this. Thanks for the ideas. Looks like you have it all going on. It is amazing how tuning can be so captivating, that bait of better sound always tempting us. I am not an Audirvana user, so no expert by any means. Though I always like it at first, I tend to go back to Pure Music. Somehow, with this system/room, I get a more authentic, less processed sound with Pure. It is like Audirvana tries to work the "analog" smoothness angle a bit much, along with a bit too much push and definition layered into this effect. Subtle though and I think loads of folks prefer Audirvana, and I have explored Pure more. You got me experimenting with it. Thanks for the reminder. One reason I really want to go further with it is that it appears to work in integer mode with my Tranquility DAC. So I will see if I can refine its settings to my tastes. It was crashing at times for me as it integrated with iTunes also. I may have solved it by lowering the memory allocation to it. They recommend at least 2.5 GB to be left for the computer. I love EQ to finish out my room problems (and preferences), and my settings are minimal (most less than 2 Db). But even if you don't use it in playback, it is an interesting and instructive way to identify problem areas for treatment. Flexes the hearing/perception abilities. On the other hand, I like the ease of letting AntiMode do the work, and the reenforcement of checking my ear against actual measurement. I was gratified to find that before I bought a used AntiMode, I had the low EQ set very, very close to how Anti-Mode did it. It is harder with mids and highs, I suspect because of the HR-1s radial dispersion making measurement difficult. Seems I can use somewhere around half the adjustments the Antimode perceives to good effect though. That puts me sort of half way back to "by ear" but I like that fine. I look forward to how your experiments end up! Palomino - IMHO, to improve your depth, you need diffusers on the rear wall and front wall. Or at very least on the front wall. A couple 1D QRD on the front wall I think would liven up the ambiance and tighten up the imaging. It would make the reverb in the recordings wrap around the room better. I think I am starting to agree with you on Audirvana. It seems to be trying a little too hard. But the combination of Audirvana and a new DAC I am trying out is giving me better sound than I had via the dock via coax or just iTunes out of the mini using optical. Everybody seems to have a favorite. I just tried Audirvana because of the free download and then the initial low price. I may have to try some of the others. Raven, I can try positioning of the absorbers and diffusers. I should have the second skyline done today. Only thing is those suckers are heavy. Also, don't forget that 3/4 of my front wall is covered with my "mathematically placed" VHS tapes Also, with a little instruction, I think I can build some QRDs. Wow 3/4 of the front wall covered with plastic? I have found an adjustment in Audirvana that helps here. It is in the Audio Filter preference, the sample rate converter. I have not played with anything else, but I set the "filter max length" for "better" - turning it up higher, and liked it less, so went with it lower and like it better. More texture and a more natural sound to me. The default setting is 500,000. With very little experimentation and listening time, I am liking it more in the 450,000 range give or take. Good luck with those diffusers! The VHS tapes are on shelves, are spaced out and are at three random depths somewhat like a diffuser. I just spaced them out on a lark one day and felt it actually helped so I left them that way. I'm gradually converting the room to a pure listening room but for now the plastics stays! I'll try the audirvana tip. Somewhat frustrated now because it locks up anytime I try to play a high res file. Also, with a little instruction, I think I can build some QRDs. I would be happy to help design, but I've not come up with a building plan I like yet that's fast, easy and repeatable. I'm out of town visiting family, but when I'm back I hope to get more time putting my garage back together, and maybe actually cutting some wood! 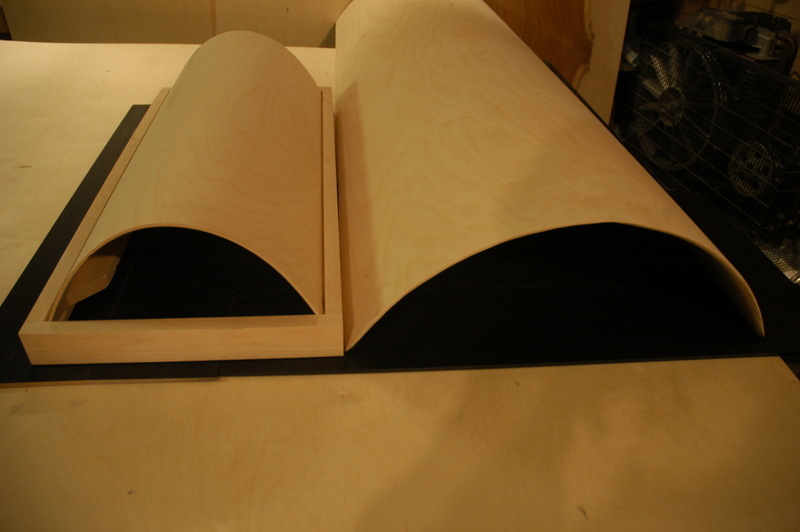 I apparently have piles of 1/8" board to use for the dividers, I just need some 1/2" wood for the wells. Also, a quick and dirty diffuser idea to see if it makes a difference - try a cylindrical diffuser, it would be light, portable, and uses very little material. I would also be easy to breakdown and reuse the materials if you decide you don't like it. Also, I was thinking about your ceiling absorber issue. If you feel it's taken too much treble away, you could always cover if it with a partial diffuser. It wouldn't have to be curved like this, but this is what I'm talking about. Just take some 1/8" panel and cut out some sort of pattern on it to increase the reflectivity, but still keeping the absorption. I like the curved ones. I could build those. The frame would have to be metal though, right? Jury is still out on the ceiling absorbers. Now I don't notice as much. I think I am going to have to get serious and do some measurements. Yeah, I'm getting close to the point to needing measurements as well. I'm just saving up for the Herbie's gear to go with the ZMA, so no spending on measurement stuff at this time. We can talk more offline if you're curious as to what measurement gear I'm considering. No need for a metal frame! Easy way would be to take a panel, say 2' X 4' - then glue some wood strips along the 4' length on the *face* of your panel. Then take another panel 2.5' X 4' (not sure on the measurement, but it would obviously have to be bigger than 2' to form the curve) and bend it to bit between those two two wood strips. Looking for photos on images.google.com - this is kinda close. Just imagine wood strips holding the curve under tension. I tried this with 1/4 inch ply and it won't bend enough. Must be 1/8". 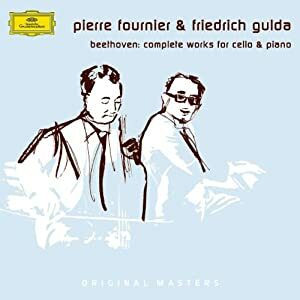 I don't know how 3D this would be in a treated room, because I don't have one in any of the three rooms I listen in, but with the ERR and the modded C amp in my parents' living room this recoding seems to have real solidity and great dynamics and especially the cello sounds very real and present. Thanks. I have enjoyed you other suggestions. I'm finding with the treatment I have done so far every recording sounds better. I am also listening at about 1/2 to 3/4 the volume which is opposite of what I thought absorbers would require. Still experimenting. Good winter break fun. Palomino, sorry I missed this. Have you emailed audioirvana. Since my stopped crashing with a change in the preference for the "Audio System" with less memory allocated to the app and more to the MAC, I am wondering if it is a memory issue. I use only 44.1/16. I wonder if the + version needs a lot of memory or if something is just haywire? It works fine with 44.1 /16. It's only an issue with higher res files. Once it detects a higher res file in a playlist it locks up. He thinks it has to do with the communication with the DAC. I am going to send him the error log. I tired out the settings you suggested and I like what I am hearing more now. Any other suggestions are appreciated. Stumbled into this great video just now! The before and after demo around 5:30 is amazing, and exactly what I keep talking about when I'm pushing room treatment! Notice the measurements show where the problems are, and demonstrate the "ringing" in the room that you can clearly hear in the before and after videos! I'm only about half way through the video right now, so I'm going to finish it off and see what else they show - I just wanted to post it before I forgot! This video is an awesome demonstration of room treatment. yes, this is a great video. I downloaded some of the tracks to see how my treatments stack up against that room. I have to say, I feel pretty good about the $160 I have spent so far. I tried to post a video, but the mic on my camcorder is pretty bad and didn't capture what I was hearing in the room. I've got a Zoom H2 recorder you can borrow - it's an older, decent digital recorder often used for small session recordings and concert bootlegs. I just need to dig it out of storage. So, I've been thinking about your saying that you find yourself using less volume with the sound absorbers - this happens a lot with home theater guys with ringing rooms. They can't hear the dialog on the center channel - it sounds a bit jumbled and buried - so we turn it up...it sounds a little better...maybe, but still jumbled, so lets turn it up, starting to sound good...but loud...still jumbled, so lets turn it up (ad nauseam) - till they piss off the wife or start feeling the effects of audio fatigue and dial it down a bit and deal with the muddled dialog. As soon as you clean up some of that ringing, you're not fighting the room for detail and frequency balance; you'll find a more natural listening level that suits the music, the gear, and your hearing tolerance! Since placing my sound diffusers on the ceiling and absorbers on the side walls, I find more intelligibility in the dialog for HT, and the 2 watt zen amp seems *louder* than it used to...probably because I'm hearing more detail and less smearing. I really need to get back into the shop and get back to building diffusers...this thread is making me practically salivate at dialing in my room better! I have started to look for mics and think I've found one that doesn't require external phantom power and works with REW. I had a friend over last night for drinks and then got him to come into the basement to listen to my system. He's and engineer and helped me procure some outlets and such that were hard to find but he could get them from his supplier. Anyway, he was clearly impressed with the sound and told me so. Minor victory for me. From what I hear, I think the highs are pretty tamed and the focus of the soundstage is pretty good. Still not as front to back as I want, but pretty good. Some music is better than others. I was at that Menards today near your house to buy some lumber to prototype some of those bent wood diffusers. I got the framing lumber, but could not get 1/8" ply. I think that is what you need to make enough of a bend. I have some other 1/8 material (not sure what you call it) and will give that a try. I still need something to keep the bass in line (upright bass booms big time) and am considering my options for corner bass traps. I'll send you the link to some I am looking at on-line for $60. Seem a bit too good to be true. If it happens like mine, losing the low bass boom will seriously contribute to resolving everything else. I've yet to see anything under a few hundred that would put a dent in *real* bass. It takes a lot of material, or clever use of specific materials to tame bass. Little pieces of foam the corners are BS. It takes lots of corner traps, and/or helmholtz resonators to get that low bass cleaned up like you heard at my place. I've got those covered in cloth, and stacked 8' tall, plus I have two of the old Decware designed CWALL, which I'm really having trouble measuring to figure out what they are doing. Plus have about 30# of insulation behind my 10' projection screen, so it acts as an absorber as well. And I still think I could use some more bass treatment to deal with a 27Hz bump I have. Cripes I have a lot of sound treatment! I'm so used to it, that I forget how much I have going on!